My assignment today was to chose a picture from my life and tell the story behind it. These pictures are from the photobooth at the shopping mall A6 in Jönköping. They're taken in November 2007. The girl with me is Natalie, one of the people who has made the most impact on my life in the shortest time. I had just re-started an old project of mine, which was to try to make my friends take photobooth pictures with me. However, not many of them wanted to. 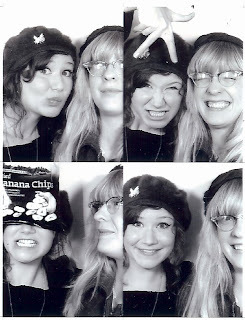 But Natalie came along with me because I was also taking the photobooth pictures for the first page of Lily of the Valley that day (which reminds me that I really should re-do the design of the page, it's been the same way for too long! Creativity project ahead!) and I didn't want to do it alone because I was going to keep the booth occupied for quite a while which I would find a little embarassing because I'd feel vain. And also I really needed someone to hand me all sorts of gear that I was holding up for the camera. After I was done we also took these, and looking at them just always make me really happy. Because Natalie is probably the most cheerful person in the world and any picture that she's in makes me miss her and be really happy I ever knew her. And I also know she reads this so heey! I miss you, come back, Åsa wants you here too, and Elin. Göteborg is meant for you and this post is just a sad excuse to make you feel guilty and return. Vill bara säga att jag tycker er blogg är en så söt idé! Gillade beskrivningen av 3 människor på spårvagnen. finfin beskrivning av Natatlie och bilden är så himla underbar!